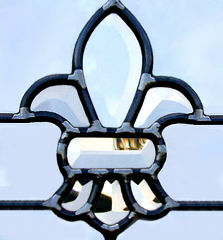 FLEUR DE LIS BEVELS IN VERTICAL LEADED GLASS SIDELIGHT WINDOWS CUSTOM AT GLASS BY DESIGN. "FLEUR1SD" CH7 and CH8 bevel sets. The background glass was clear with a Waterglass border. CH8 clear bevel set is 4 ½" x 6". CH7 clear bevel set is 6" x 8 ½".